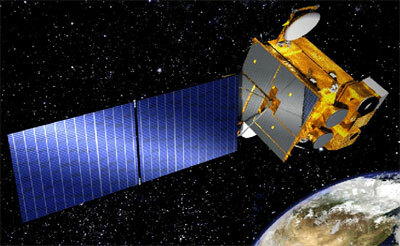 Korea Ocean Satellite Centre, GOCI satellite data download - need to be a registered PI. GOCI is the first ocean colour sensor to be launched in a geostationary orbit. The major advantage of a geostationary orbit for ocean-colour studies is better temporal coverage. GOCI has a revisit time of around 1 hour and can readily monitor tidal effetcs, the movement of dust and sea fog as well as development of forest fires and typhoons. Below are some animations prepared from recent GOCI imagery (courtesy of KOSC members Joo-Hyung Ryu and Tai-hyun Han). Click on the images to start the animation. 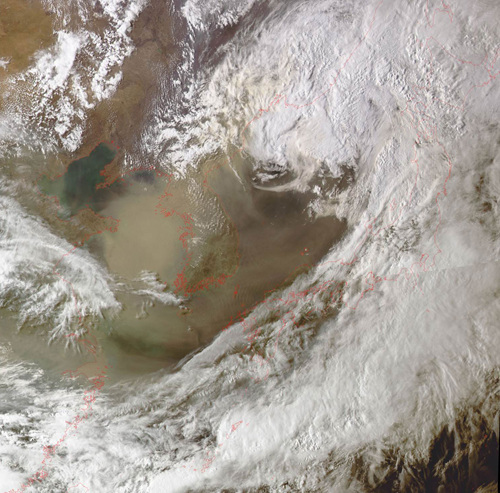 Yellow Dust (30 April - 1 May 2011): In these images, the dust originates over the deserts of Mongolia and northern China and is carried eastward by prevailing winds, passing over China as well as North and South Korea. 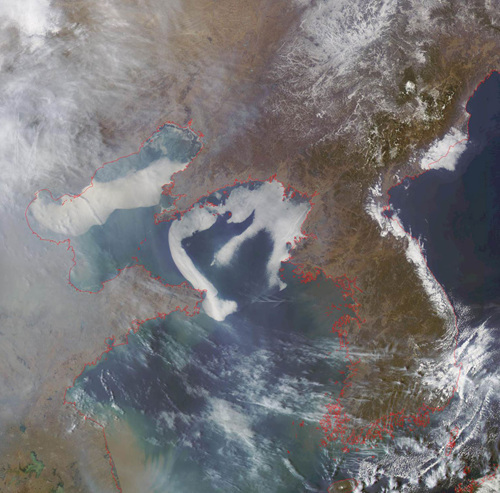 Sea Fog (20 - 22 February 2011): The sea fog develops over Bohai Bay and the Yellow Sea, and moves eastwards towards the coast of China. It is only formed over the sea and disappears again in coastal areas once it reaches land. 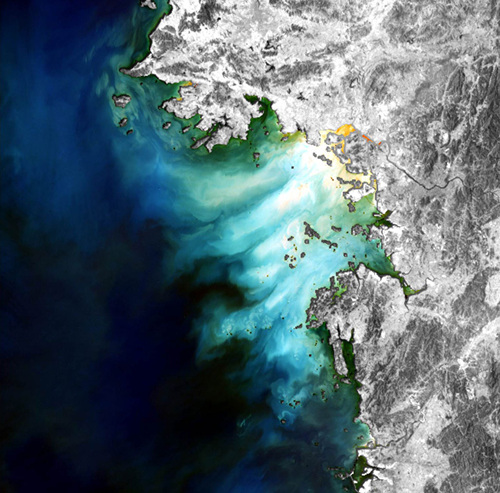 Tidal Changes in Gyeonggi Bay, South Korea (16 April 2011): These images show sea water flowing into Gyeonggi Bay as the tide rises, and the tidal-flats being covered by sea water as time progresses. 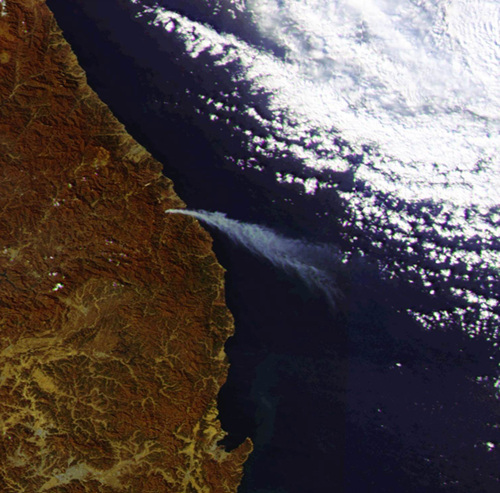 Forest Fire in Samcheok City, South Korea (3 December 2010): These images show a forest fire in Samcheok City, on the eastern side of South Korea, with smoke spreading in a south easterly direction. 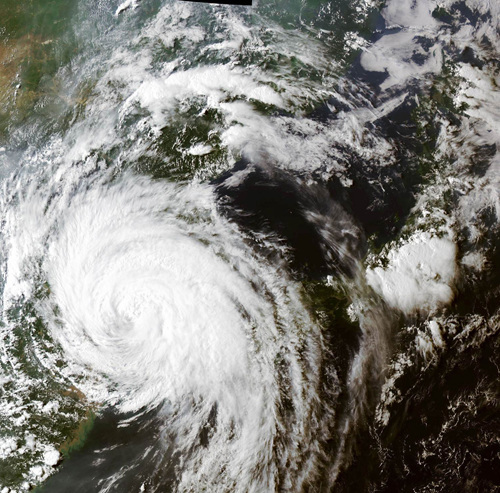 Typhoon Muifa (6 - 9 August 2011): These images show the progression of Typhoon Muifa which was generated over the north-western Pacific, and passed by the Korean peninsula.